R&D Center will create new solar cells for spacecraft power systems. 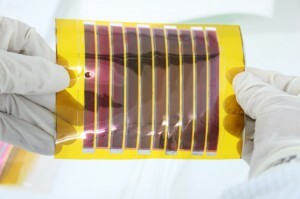 The main objective of the technology is focused on production of solar cells on flexible polymer substrate. New development will improve solar cells specific characteristics that increase spacecraft payload. This area of R&D Center activity is part of research and development program in the field of solar energy, implemented by the scientific team of R&D Center. The program is aimed at improvement of existing solar module manufacturing technologies. On the 1st of February 2013 the deputy of CEO of the State Corporation “Rosatom” Vyacheslav Pershukov and deputy of CEO of the JSC “Science and Innovation” academician VP Smirnov. The guests got familiarized with the technology of solar modules production and with other promising areas of research in the R&D center that might be of interest for the State Corporation “Rosatom”. On the 5th of December 2012 the first ceremony of awarding the prize InnoWay was held. The awards were given to undergraduate and graduate students – authors of works in the field of solar energy and energy efficiency. The initiator of the selection and promotion of research projects is the company “Hevel” (joint venture between Russian Corporation of Nanotechnologies(RUSNANO) and Renova Group of Companies), with the support of the “Skolkovo” Foundation, Skolkovo Open University (OpUS) and the venture fund Navi Capital Management Inc. The first 8 winners were selected by experts of solar energetics. Beside that the R&D center that was created with the active participation of the Company “Hevel”. On the 26th of October 2012 the world renowned expert on solar energy, a consultant of firm Wista Management GMBH Adlershof-Berlin Professor Klaus Thiessen visited R&D center and got familiarized with the technology of solar modules production and with other promising areas of research in the R&D center that might be promising for future joint cooperation with German research centers. On the 25th of October 2012 the delegation of the National Scientific and Technological Holding “Parasat” from the Republic of Kazakhstan headed by the Director S. Zh. Tokmoldin visited the R&D center. Questions of scientific collaboration and training of young personnel in the field of solar energy was discussed. 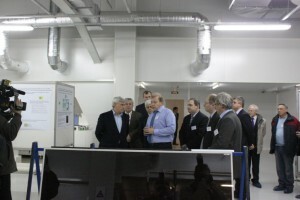 On the 16th of November 2012 executive CEO of the Skolkovo Foundation Energy Efficient Technology cluster got acquainted with the equipment of the R&D center and with the created on the territory of the R&D center Common Use Center “Optoelectronics”. On the 12th of October 2012 participants of the “Open University of Skolkovo” visited the R&D center and got acquainted with the technological and research equipment. On the 11th of October 2012 R&D center was visited by Robert Wilson (Nobel laureate in Physics in 1978 “for his discovery of cosmic microwave background radiation”). R. Wilson was participating in the scientific forum “Science and Society. Science and Human Progress”. During this visit R. Willson got familiarized with the research works in the field of solar energy that take place in the R&D center. 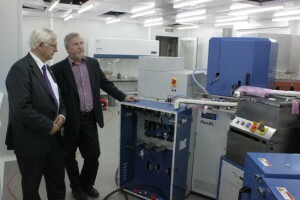 On the 10th of October 2012 R&D center was visited by the Nobel Prize Winner in Chemistry (in 2000), Professor at the University of Santa Barbara (California) Alan J. Heeger. 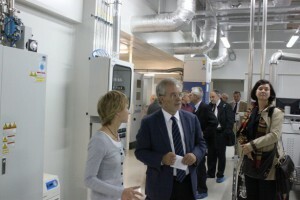 The main aim of the visit, that took place in the frames of St. Petersburg Scientific Forum “Science and Society. Science and Human Progress”, was to get familiar with the research focused on increasing of the thin film solar module efficiency, conducted in the R&D center. On the 17th of September 2012, the delegation of the European Research Council (ERC) headed by the General Secretary of the ERC professor Donald Dingvellom visited R&D center in order to get acquainted with one of the leading high-tech research and development organizations of Russia. VIII International Conference “Amorphous and microcrystalline semiconductors» (AMS-8) was held in cooperation with the R&D center (from 2 to 6 July 2012 in St. Petersburg). This conference was attended by 180 scientists from 14 countries. The conference is dedicated to amorphous micro-and nanostructured semiconductors. The delegation of the participants of the conference visited the R&D center and got acquainted with the technology of silicon thin-film solar modules. 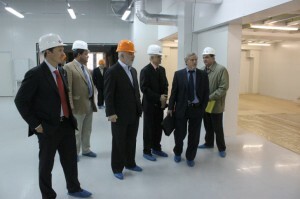 On the 11th of May 2012 the delegation headed by the Minister Counselor for Energetics of the Bolivarian Republic of Venezuela in the Russian Federation Hoglis Jesus Martinez Nunez visited the R&D center. The prospects of development of alternative energy, including solar energy, and the educational issues of young professionals in this field have been discussed during the visit. 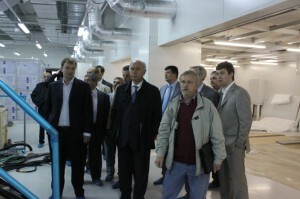 On the 12th of April 2012, the delegation headed by the president of the Skolkovo Foundation Viktor Felixovich Vekselberg got acquainted with the ongoing application works progress on the R&D center equipment. 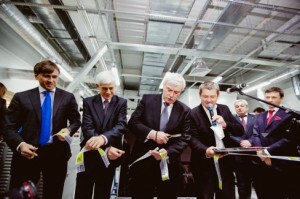 In the 2nd of February 2012 several events related to the activities of the innovation center Skolkovo were held in St. Petersburg. These events were attended by the Governor of St. Petersburg, Georgiy Poltavchenko, vice-president of the Skolkovo Stanislav Naumov, heads of JSC “RUSNANO”, Technopark “Skolkovo”, LLC “Hevel” and other organizations. 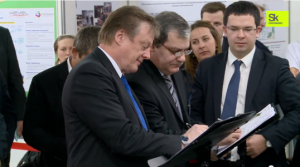 A framework agreement on joint research works between the R&D center and the thin-film technology company Oerlikon Solar have been signed during solemn opening ceremony of the R&D center. The latter agreement assigned conduction of competition of works of young scientists, nominated for the the Navi Capital Management Inc. Award. The event was finished by press briefing for numerous media representatives. 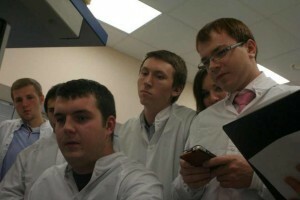 On the 3rd of November 2011 an organizational meeting was conducted in the R&D center. The possibility of using of scientific equipment by residents of Skolkovo Foundation in the frames of Common Use Center “Optoelectronics” project was discussed in St. Petersburg under the supervision of the Director of R&D services of Company “Technopark” Skolkovo Andrey Sartori. 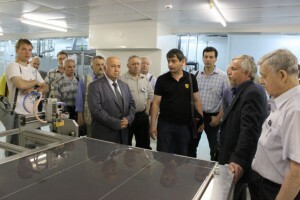 On the 21st of June 2011 the Head of the Republic of Mordovia Nikolai Merkushin examined equipment for solar modules production of the Oerlikon company installed in the R&D center. On the 15th of June 2011 the Chairman of the Board of Directors of the group of companies “Renova” Viktor Felixovich Vekselberg visited the R&D center to review the works on installation of the equipment of the Oerlikon company in the R&D center. 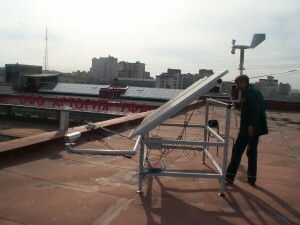 Installation of experimental system on the roof of the technical college of the Astrakhan state university was finished. The assembly includes various photovoltaic modules and is designed to test solar modules under real sun radiation conditions. The monitoring system was developed in the R&D center for thin-film technologies in energetics. Control of system operation and the analysis of the obtained data is made remotely: all information is transferred via internet connection and is saved in the network database, so the specialists of the R&D center observe continuously updated data of module’s operation parameters, of sun radiation level and of weather conditions on the installation site. 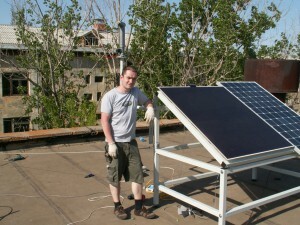 Measurement set up of system that enables monitoring of the photovoltaic modules (supplied by R&D center for thin-film technologies in energetics) was assembled on the roof of one of the buildings of the Ufa State Aviation Technical University (USATU. In addition UGATU and R&D center have signed agreement on scientific cooperation in the field of renewable solar power by creation insolation monitoring system in the Republic of Bashkortostan, by joint participation in research and development projects and by training of qualified personnel in the sphere of renewables.